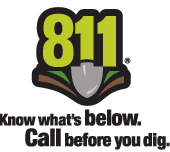 Always call 811 well in advance of digging. The single greatest cause of pipeline accidents is damage from excavation and outside forces. If you plan to dig, blast, bore, trench, drill, grade, excavate, or move earth in any way, please call Underground Service Alert (USA) by dialing 811 at least two working days ahead. 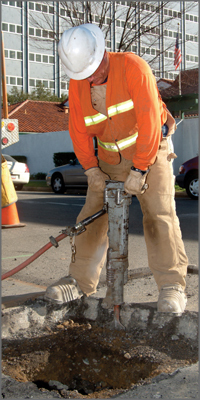 This free service will notify underground utilities in the area of your planned work, and PG&E will locate and mark their underground gas and electric facilities. Before you call, delineate your excavation area with white paint, flags, or stakes so locators can easily identify and mark affected utilities. Be aware of pipeline markers that indicate the need for extra care around a high-volume transmission line. These markers specify the line’s approximate location, but not all pipelines follow a straight path between markers. If your proposed excavation is within 10 feet of a natural gas transmission line 60 PSI or greater, you will be notified that a meeting with PG&E at the job site is required prior to any excavation activities. Call the number on the marker if you notice suspicious activity nearby, or if you see construction-related activity and there are no PG&E personnel present. Call 811 at least two working days before digging, so underground utilities can be marked and you can work safely.